Eliminator system ... applied on key Turkish bridges. UK-based Stirling Lloyd says its Permare EPW Tropical system has passed rigorous new testing to new standards to allow its use in the continued protection of the majority of Zamzam water storage structures in Makkah, Saudi Arabia. These storage structures supply water that in the Islamic faith is considered sacred. The standards created by the Saudi Geological Survey (SGS) – set up by the Zamzam Studies and Research Centre (ZSRC) – ensure that the water used by the millions of pilgrims who visit each year retains the highest possible quality, says Stirling Lloyd. The new standards aims to revalidate and improve previous product approval processes associated with the Zamzam water facilities. A durable, seamless and liquid-applied coating, Permare EPW Tropical has provided internal protection on Zamzam water holding structures without the need for repairs or re-coating since 2004. Despite this track record, there was still a requirement to be retested and SGS set out stringent pass/fail criteria according to the highest international standards for all tanks, Hopper says. “The new testing regime reaffirmed that Permare EPW Tropical has absolute compatibility with potable water, ensuring its unique flavour, chemical composition and curative properties are retained. Further experiments, limited to the supplied material at the set experiment conditions, were carried out to test the material leaching at the maximum temperature of 50 deg C. The system also passed the requirements for not promoting the growth of aquatic micro-organisms,” he says. Since providing 12,000 sq m of high-performance Permare EPW Tropical for the initial tanking and lining of the Zamzam water tanks, Stirling Lloyd has worked extensively on the protection of structures in Saudi Arabia including further Zamzam water tanks. Other past successful projects include the Buraidah sewage treatment plant and water tanks and reservoirs in Buraidah, Madinah, Jeddah and Riyadh, as well as the High Point Reservoir in Madinah, the world’s largest underground reservoir where 1.2 million sq m of Permare EPW Tropical was applied. 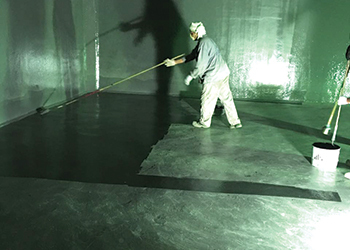 Established for more than 40 years, Stirling Lloyd develops and manufactures high quality products for use in the protection of infrastructure, through waterproofing, surfacing and highway maintenance products. 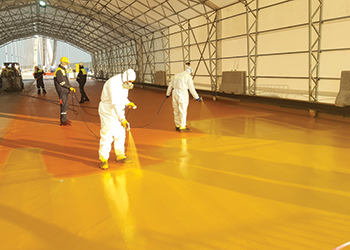 From bridge deck and structural waterproofing, car-park refurbishment to skid-resistant surfacing, roofing, tanking and lining, its innovative products are used all over the world. The company pioneered the use of cold, spray-applied waterproofing systems, revolutionising performance and ease and safety of application. Permare EPW Tropical system ... being applied to Zamzam water storage structures. Its Eliminator system was specified for the waterproofing of two new high-profile bridges in Turkey and was applied in record time. The system was used to cover a total of 76,000 sq m for the Osman Gazi Bridge and 37,435 sq m for the Yavuz Sultan Selim Bridge. Built over the Sea of Marmara in Turkey’s Izmit Bay, the Osman Gazi Bridge opened to service on June 30 this year. The fourth longest suspension bridge in the world, spanning over 1.5 km, the bridge enables passengers to make the journey across the sea in just three minutes instead of joining the long queue to take the one-hour intermittent and uncomfortable ferry ride or the alternative highly trafficked 100 km detour over land. The Yavuz Sultan Selim Bridge (Bosphorus 3) is part of the projected 260-km-long Northern Marmara highway. This suspension cable bridge is the longest combined motorway/railway bridge in the world and is the eighth longest suspension bridge. Aside from its sheer length and size, the bridge is equally significant for its powerful logistical positioning, as it will be part of a ‘New Silk Road’ linking China and Europe by rail. The bridge was inaugurated on August 26 this year. “Over the past 15 years, the Turkish state highways agency KGM has specified Stirling Lloyd’s Eliminator system for several successful high-profile collaborations in Turkey. Such celebrated schemes include the Fatih Sultan Mehmet Bridge, Bosphorus Bridge and Haliç Bridges. As a result, KGM selected the Eliminator system for these projects, too,” says Daghan Erel, regional sales manager at Stirling Lloyd Polychem, for Turkey and Central Asia. The applicators were able to apply 4,500 to 5,000 sq m of the waterproofing system per day on the Osman Gazi Bridge, facilitating quick contract progression. “This was made possible due to the speed and ease of application of the Eliminator system, together with the fact that each element of the system cures in under an hour, enabling the next element of the system to be applied immediately,” Erel explains. “Given the significance of these projects, we were under a great deal of pressure to ensure that the Eliminator was applied quickly and effectively to protect the bridges for decades to come. To meet these objectives, we had skilled teams on board to ensure that the product could be applied quickly and safely. We are confident that our product will protect the bridge decks for years to come and will help them to stand the test of time,” Erel concludes.